pasta, beautiful pasta. we’ve been eating a lot of it recently. pasta is is a good way to keep everything affordable, it keeps for a long time in the pantry, and it’s great for holding so many amazing and varying flavors. it’s also filling, and my kids love all the different shapes and colors we use. when we go to a restaurant that has anything pasta on their menu, i order it. what can i say? i’m just a pasta girl at heart! 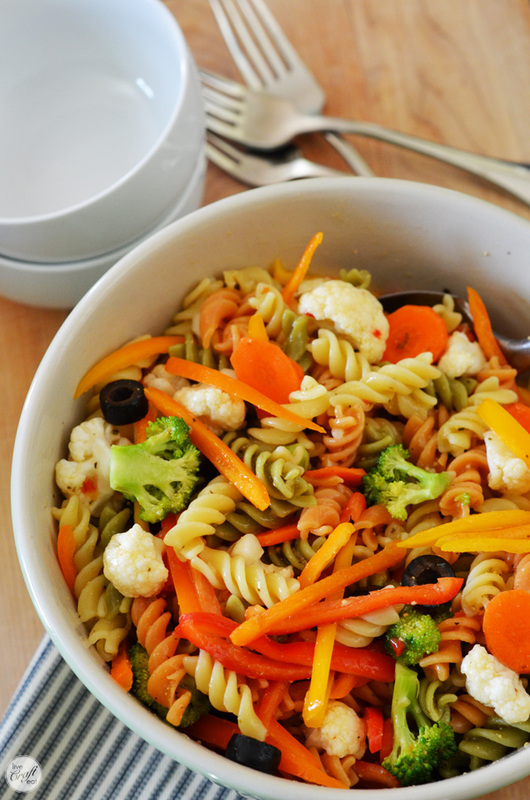 for example, we recently made this fruity chicken pasta salad. for dinner the other night we had chicken & bacon pasta salad. and for lunch a few days ago my kids and i made crock pot macaroni and cheese. 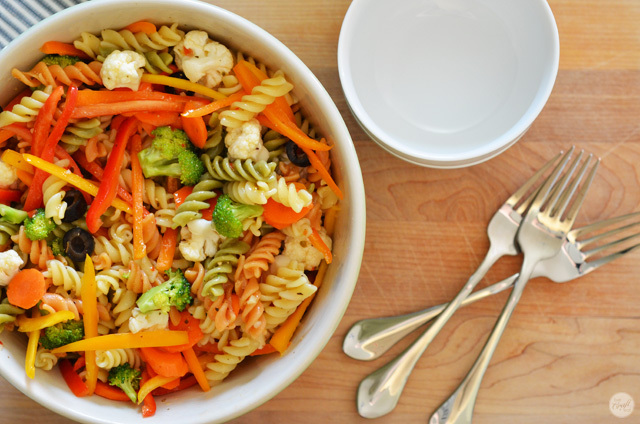 and since we’ve been experiencing some busy days recently, i made this super easy italian tri-color pasta salad just to have on hand in the fridge for a quick lunch. it’s delicious, filling, and full of healthy vegetables. and to put it all together couldn’t be simpler. 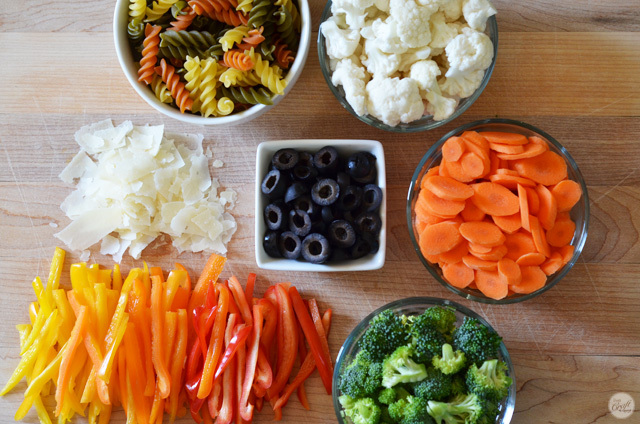 just gather a few vegetables: carrots (sliced), cauliflower (cut into small, bite-sized pieces), broccoli (cut into florets), red, orange, and yellow sweet peppers (thinly sliced), and black olives (sliced). 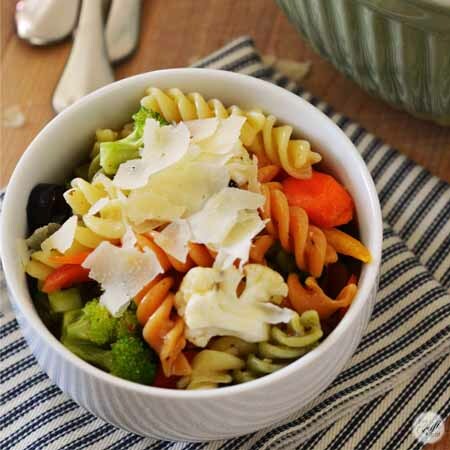 now all you need is some pasta – we like tri-color spiral pasta because it has a fun shape and makes the salad even more colorful. top it off with some parmesan cheese, and some homemade (or store-bought) italian dressing. we had some store-bought on hand so we used it. first you’ll need to get the pasta cooking according to the package directions. when it’s done, drain the water and run it under cold water to stop the cooking process and to cool it down – this is a cold salad, after all! drain the pasta again. meanwhile, while you’ve got the pasta cooking, prep all the vegetables and throw them into a large bowl. add in the cooked-and-cooled pasta, and add as much dressing as you’d like (you don’t want it to be swimming in dressing, but you do want to be able to taste it, too!). throw in some shaved or shredded parmesan, toss everything together, and you’ve got a simple, colorful, and amazing salad to serve at your next potluck, dinner, or lunch. 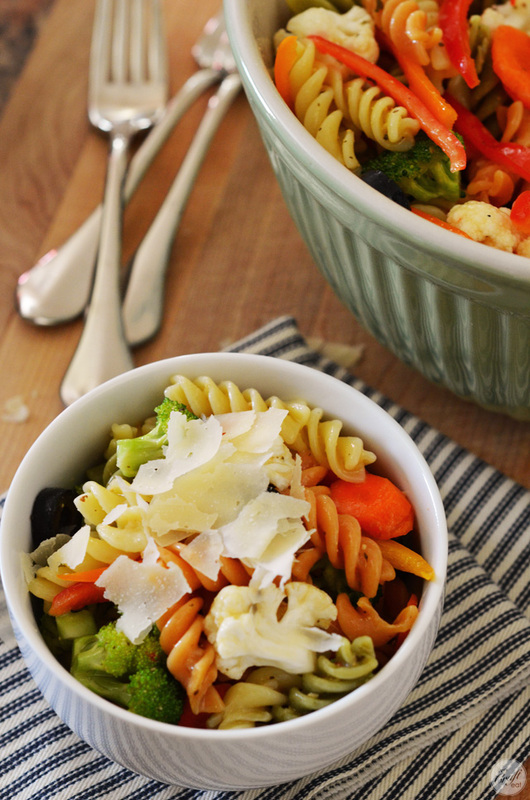 i think i’ll go ahead and have a bowl myself – extra parm, please! cook pasta to al dente in boiling water according to package directions. drain. rinse until cold water to stop cooking and to cool. drain again. combine everything into a large bowl and add italian dressing to taste. refrigerate for at least 1-2 hours before serving. enjoy!